A wonderful easy horse with advanced training. A real beauty given his usual colour for an Iberian bred horse. 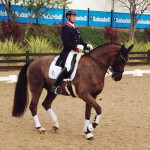 Training level: Lateral work, Excellent Walk, Very good moving young Dressage talent.